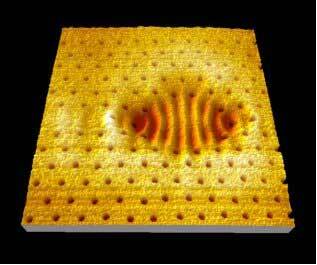 (Nanowerk News) Using the tip of an Atomic Force Microscope (AFM), it is possible to map the wave pattern of light, trapped in a so called optical resonator, with unprecedented precision. 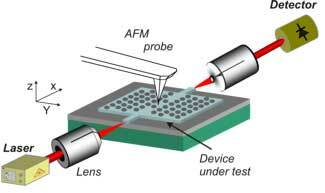 Apart from that, the AFM is also capable of playing with the light, to optimize the performance of the resonator. If the optical crystal doesn’t work at the correct colour of light, for example, this mechanical correction works out well. It is even possible to build a mechanical-optical switch in this way. Wico Hopman, a PhD-researcher within the Integrated Optical MicroSystems group of the MESA+ Institute for Nanotechnology, published his results in the online journal Optics Express. With the AFM-tip, about ten nanometer in size, Hopman is able to manipulate light that is locked up in an optical crystal; a sort of cage in which light is trapped. An optical crystal has a pattern of holes at which all light reflects and comes together in a cavity where no holes are present. In this cavity the light resonates at a specific colour. This makes optical crystal highly suitable to act as selective filters for certain colours of light. Whenever Hopman scans the cavity with the AFM-tip, the light ‘feels’ the presence of the needle, the colour is influenced lightly and the filter is going to do its work for the new colour. In this very precise way, Hopman can demonstrate the way the light is divided in the cavity. Thanks to this extremely high precision, Hopman can locate the ‘hot spots’ at which he can manipulate the light best. Within these hot spots, the colour can be modified in the best way and also the selectivity of the filter is manipulated: how well will it distinguish one colour from another? If the crystal has small defects, it may not perform optimally, and the AFM-method is capable of compensating for these defects. Building a fast optical-mechanical on/off switch is possible in this way to. The distance the needle has to travel is just some nanometers, this can be done in nanoseconds time. An interesting follow-up is now, how to integrate the tip and its control within the crystal. In this research project, Hopman has closely collaborated with the Biophysical Engineering Group, of the University of Twente as well. This group investigates the properties of fluorescent proteins. Manipulating the light properties of these proteins within an optical crystal could be an interesting option, which is to be investigated into more detail.